We've had a few threads before regarding Henry Ford's interest in the use of alcohol as a source of fuel. The thread below became somewhat "heated" regarding Ford, Ethanol, and whether or not Model T were suited for ethanol use. 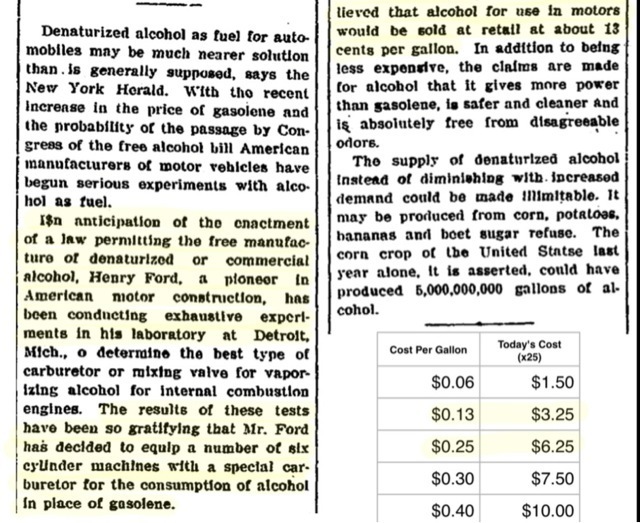 Looking at the highlighted portions of the article, Henry Ford is reported to have been experimenting with the use of alcohol with the six cylinder (Model K) machines, and goes so far as to say he will equip "a number of six cylinder machines with a carburetor for consumption of alcohol in place of gasolene." The article goes on to explain, what I feel, was the motivating factor in the "free alcohol" movement. An opportunity to find another fuel source because of the then limited (and as a result, high priced) availability of gasoline. As the article points out, the price of gas has risen from around 6 cents per gallon to around 25 cents, and in some cases 30 cents, with projections of 40 cents per gallon. While this seems inconsequential to us, if you look at the chart I placed at the bottom of the article, 25 cents in 1906 equals about $6.25 per gallon in todays dollars. And if the price had risen to .40 cents, $10.00 per gallon today! A couple more related articles from the period. 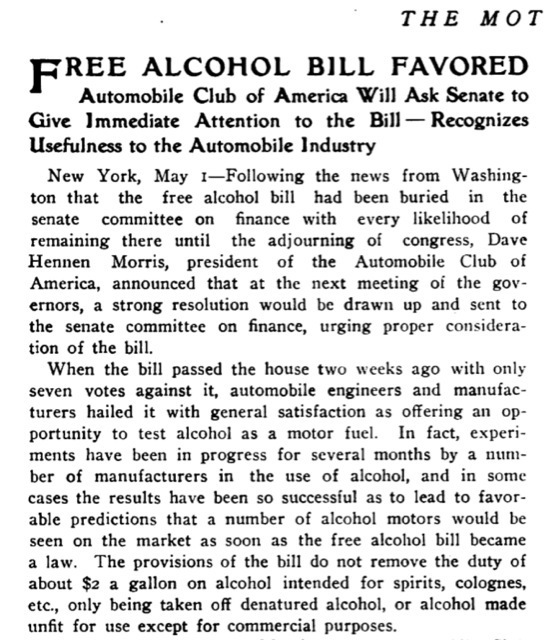 It appears there was a coalition of farmers (well over half the U.S. population at the time), fledgling automobile industry and automobilsts to pass this legislation and begin an ethanol industry. 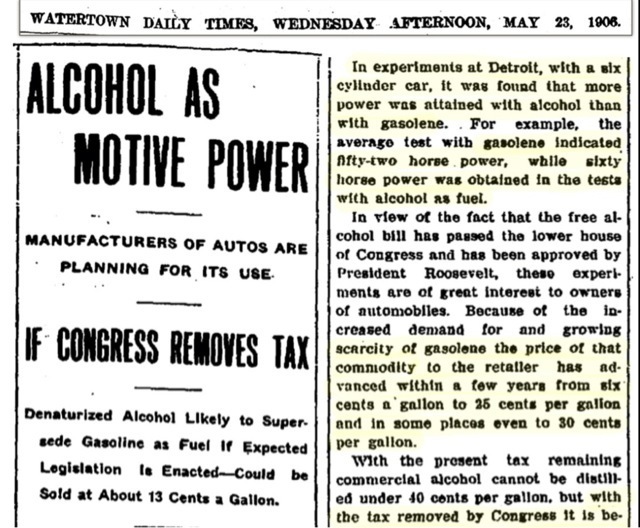 I wonder how ford was able to get more power from his Six with alcohol as most modern test show conclusively that there just isn't as much available power from ethanol? I don't know if this was a little "showmanship" or embellishment by a Ford spokesman (unfortunately we seldom know if Henry Ford is being quoted directly or if this is (I suspect) correspondence from FMC, in which case it may be any number of Ford front office people writing the press release. Is it possible that fuel was inconsistent and/or low octane to a point where it was similar to ethanol? It does appear several groups were serious about ethanol as an alternative. 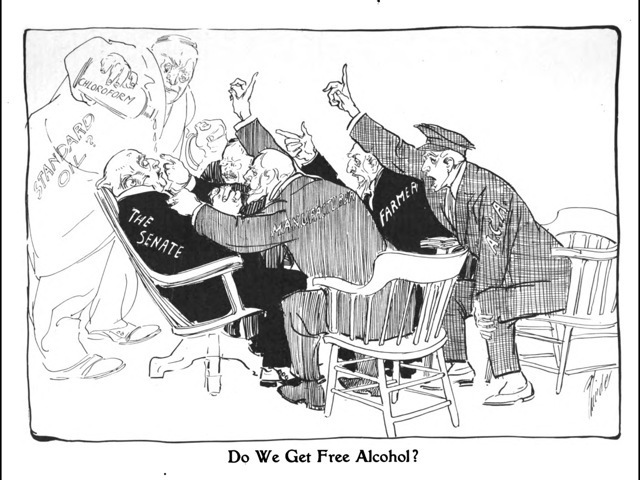 I thought it interesting that Standard Oil is seen in the background of the cartoon holding up action by the Senate. Since it only mentions changing the carb, I wonder if it wasn't a little embellishment, or poorer gasoline than we are accustomed to. If he had changed the compression ratio, I have little doubt he could have gotten better performance, but it didn't mention that. Was the lead article from THE WATERTOWN DAILY TIMES paper of Watertown, NY or Watertown, MA, or Watertown, MI or Watertown, WI ? Are you nearby. I have some K owner stories from Watertown I'd like to find more about. One was a Model K won at an Elks raffle in 1907. We'll see the name F. W. Teves again. He's the driver of the Ford leading the racers out of Central Park three years later, in the Ocean to Ocean Race. Gasoline, as such, was barely refined at all in the first decade of the last past century. That sort of refining (extensive cracking) was a later development. The octane equivalent for gasoline from that time has been estimated to be in the low to mid 60 range. And we complain today that our regular gasoline was dropped some years ago down to 89 octane. (Oops, Rob may have to delete me now?) Meeting or even exceeding the gasoline of that era with alcohol would not have been difficult. Does 50 octane gas have less energy than modern gas, or is it just harder to ignite, and more explosive?